Are there any drawbacks of BPA? BPA could disrupt the hormones in human if you exposed your body more to it. It can lead to the health issues like neurological disorders, heart problems, asthma, diabetes and many more. Nowadays the BPA free food dehydrators have got more popularity due to the rising health concerns among the people as well as in the manufacturers. 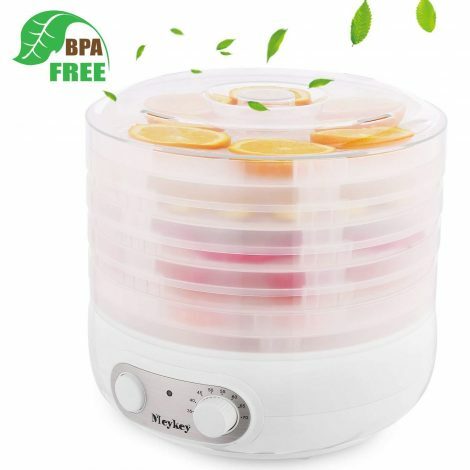 In the below article, we will review the top 5 best BPA free food dehydrator, and we will also provide you some vital information that can help you in making a wise buying decision in the end. Buying the BPA free food dehydrator is always a beneficial choice if you are concerned about your as well as your family member's health. It does not release any harmful toxins when coming into contact with the high temperature and heat. 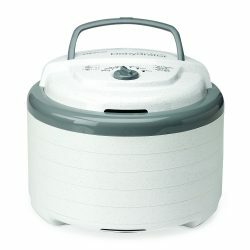 You can cook your food in BPA free food dehydrators without any worries. Below you can read the reviews of the top 5 best BPA free food dehydrator which we have picked after doing an extensive study and research. All of them belong to the renowned brands and have fetched good customer rating and reviews from the buyers. The Gourmia GFD1950 is the BPA free food dehydrator which comes with the nine big size trays. You can prepare dried sticky dates, pineapple slices or beef jerky quickly in it. You also get a drip tray and fruit leather sheet with it. The controls of the unit are precise, digital and straightforward for the 360 degrees airflow and even drying. There is no need for trays rotation. Its door is also apparent for the stress-free viewing of the drying process. It is high quality and safe product to buy which is BPA free and ETL certified. 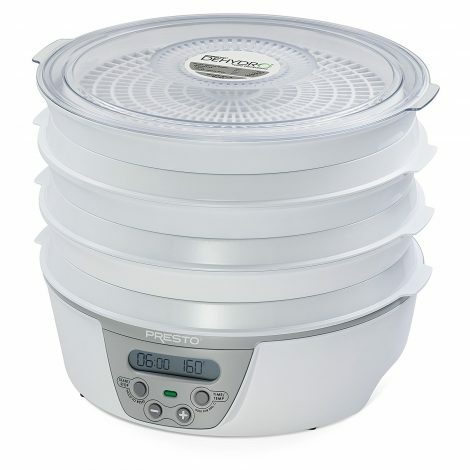 One more renowned name in the list of 5 best BPA free food dehydrator is Presto 06301 Dehydro Digital Electric Food Dehydrator. It is a six tray machine that dries out your food without spending much expense. You get the sample packets of jerky cure and spice with it for making jerky from poultry, meat or seafood. 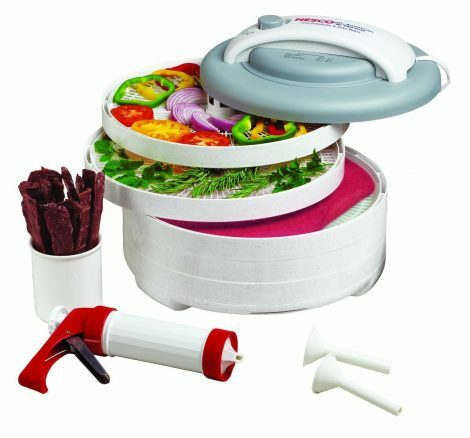 The Nesco FD-61WHC Snackmaster Express Food Dehydrator is one more BPA free food dehydrator which is an all-in-one unit. 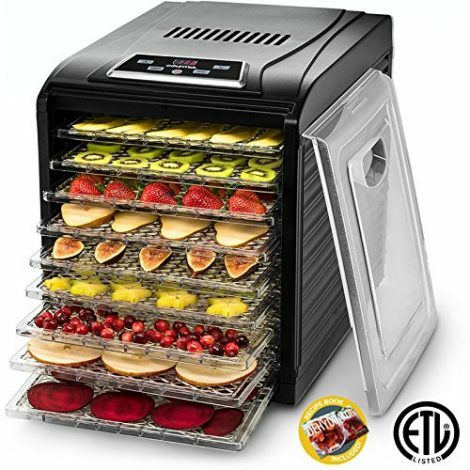 It comes with the top mounted fan that helps in the quick and uniform drying of the vegetables, fruit, and jerky. You get five drying trays, fruit roll sheet, recipe guide, clean a screen for drying herbs and a jerky gun along with the unit. The wattage power is 500 watts which offer maximum quality and speed while drying. The drying space of the unit can get extend up to twelve trays. The outer body of the dryer machine is vita-save which does not let the light to enter into the machine, and hence all the vital nutrients of the food also remain intact inside. It manufactures from the BPA free material which makes the unit a safe appliance for cooking. The final name on our list is Nesco FD-75A Snackmaster Pro Food Dehydrator. It is a BPA free food dehydrator that has the adjustable thermostat which let you dehydrate the food at the right temperature for different types of food. The top mounted fan of the unit is also quite powerful. The wattage power of the machine is 600 watts which are very strong for drying hard foods like meat and jerky. You get five trays while buying the dehydrator but you can extend it up to twelve as per your need. The dense Vita-Save external body benefits in blocking the damaging light that rescinds nutritious content of foodstuff being dried out. While drying food in the machine, you don’t have to worry about the tray rotation or flavor mixing at all. It allows you to cook different type of recipes like turkey, fruit leather, dried herbs, jerky or meat, etc. 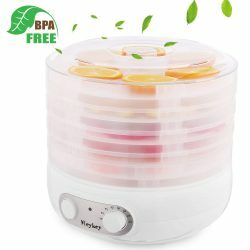 The next name in the list of 5 best BPA free food dehydrator is MeyKey Food Dehydrator Machine. It is a multifunction appliance that cooks tasty fish and meat jerky. You can also prepare fruit leather, yogurt, trail mix, banana chips, dried veggies and many more things in this incredible machine. The construction, as well as the trays of the unit, is completely BPA free and thus you can safely dry your food in it. It is an easy to store and easy to clean appliance which is dishwasher safe also. You can adjust the temperature and the height of the unit as per your requirement. The 500 watts drying motor of the appliance delivers maximum quality and speed for drying food. There is an automatic shut off option given in this BPA free unit for the avoidance of overheating. The 500 watts drying motor of the appliance delivers maximum quality and speed for drying food. Q1) I am looking to buy a plastic food dehydrator, but lots of people told me that plastic products are harmful. Is this true? Well! In comparison to the stainless steel, the plastic material is less safe. But it does not mean that you should not buy the plastic food dehydrators. You should go for that plastic dryer machine which made from BPA free plastic material. It is not only safe but also allows you to cook your food worry free. Q2) Does the BPA free food dehydrator are costly than the other food dehydrators? 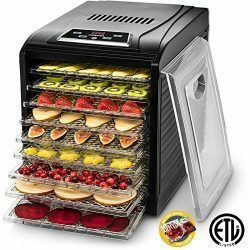 No, the BPA free food dehydrators also come at the reasonable price on the market like any other food dehydrator. In comparison to the plastic grade units, it includes some little extra cost which is quite bearable. Q3) Does the food cook in the dehydrators made from the plastic grade material are harmful to health? Yes, the food cook in the food dehydrators made from the plastic grade material is harmful to health. When you heat the plastic during the cooking, it releases some harmful toxins and chemicals that affect the hormones in our body, and hence you get to suffer from dangerous diseases. Q4) Which brands manufacture the BPA free food dehydrators? Almost every big brand manufactures the BPA free food dehydrators like Presto, Nesco, etc. You can search for them before buying. Q5) How will I know that my food dehydrator is BPA free or not? It is quite easy to check that your food dehydrator is BPA free or not by merely viewing the product specifications or details of the product. In fact, all the manufacturers mentioned on the online shopping websites about this feature. Q6) Where can we buy the BPA free food dehydrators? You can easily buy them on the famous online shopping website called Amazon at the very reasonable price. Q7) What are the benefits of drying the food in the BPA free food dehydrator? The food dried in the BPA free food dehydrator is not harmful to you and your family member's health at all. You can eat the food without any worry. The food dried in food dryer machine made from regular plastic is not safe to consume. Here you reach the final destination of our article! The BPA free food dehydrator is becoming quite popular these days among the people who are health conscious. That is the reason that most of the manufacturing companies are concentrating on the production of BPA free food dehydrator instead of the plastic grade food dehydrators. In the above article, we have reviewed the top 5 best BPA free food dehydrators thoroughly. All of them possess lots of advantages that can be the offer to a buyer. Thus, you have to think now that which BPA food dehydrator in the above list matches your needs and budget. Whatever product you pick for yourself, we know that it's going to be part of your kitchen for the very long time. Are there still any doubts in your mind related to the above content? Then, please ask us in the below comment box. We will answer to you immediately. Can I dehydrate cooked food in it ? For ex. Vegetable gravy, Dal, Rice, Chicken with gravy, chicken Biryani etc. I guess there is no point of dehydrating vegetable gravy or chicken biryani I guess. Please understand the use case of the dehydrator and how it works. You can search our blog to know more about it.